Journey on Google Cloud for most people starts with registering, setting credit card info and then diving into Cloud Console to use awesome products and services. Google is gracious that it gives 300$ of credit for start, so you can freely explore and don’t worry that you will be billed from your own pocket from the first minute. 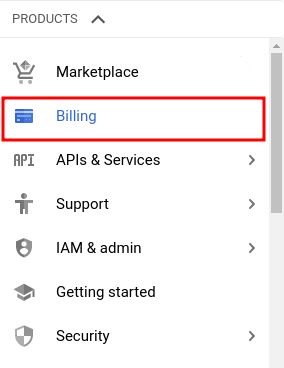 Billing is topic on it’s own and here I have in mind small to medium sized companies who are starting with Google Cloud and don’t have complex billing structure. You can be notified if there are some unexpected costs, this can happen when you deploy new version of your code and due to some bug it can consume more resources than expected. Again you don’t have to wait until invoice to find out. You don’t go to Cloud Console often (thus you could check current cost) because your are not developer but rather manager and you have other things to do but in some way you are responsible for cloud bills. 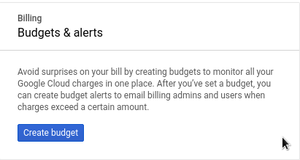 In other words it’s a must to set Budget for your Billing account. Next we’ll go trought process of setting budget and alert and see what kind of options there are. 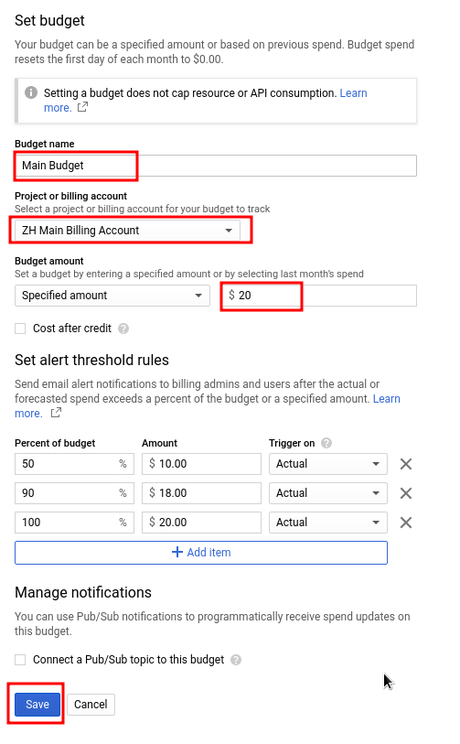 In order to use paid features of Google Cloud, you must link project to Billing Account (and create it if you don’t have any). Billing Account contains information like payment settings, reports, invoices etc. Budget Amount: There are 2 options to set amount. One is to simply specify fixed amount for your budget. Other option is to set budget amount based on “Last month’s spend” which will dynamically change every month. Of course this depends on the nature of your costs on Google Cloud. 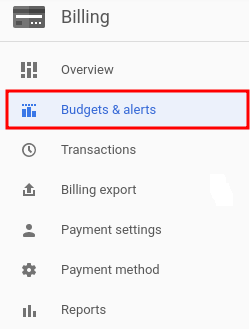 if you have relatively stable costs through the months, it can make sense to set based on “Last month’s spend”, since if you get alert for 50% reached budget in the middle of the month, that should mean that everything is ok. If you are doing creating / deleting lot of resources, trying out new things, than it makes more sense to set some fixed amount. Cost after credit: If checked, this means that credit amount won’t be taken into account when alerting. 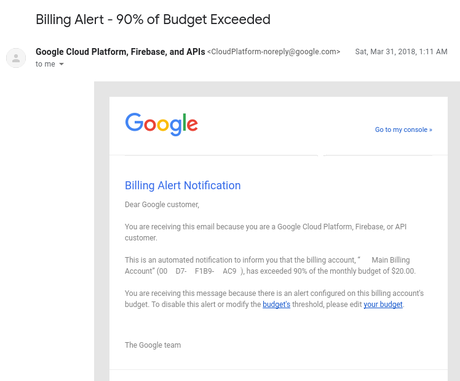 For example, lets say you started using Google Cloud and you have 300$ of credits and set first alert for 10$. In case Cost after credit is checked, you will be notified after you spend 300$ of credit and 10$ of yours. If Cost after credit is not checked, you should be alerted when you spend first 10$ (from what ever source). I admit I’m not 100% sure if this is how it works, but based on description, it should. I’m over my budget, now what? It’s not the end of the world. Hopefully there is not much time lag between receiving alert and reading it, so you can react if necessary. 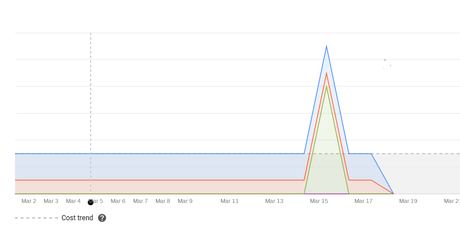 Quickest way to diagnose unexpected costs it to go to Billing -> Reports in Cloud Console. There you have nice graph and list of most consuming resources with current monthly costs and predictions which should give you idea where potential problem is.